My family has left me. Or maybe I left them first. The lock on our bedroom door clicks, and Ringo whines. A new thought settles, one I don’t dispute. One I know is the truth. After months of uncertainty, of dread, of fear over who—or what—I’ve become, I have my answer. My husband is terrified of me. I am a monster. The Promise Between Us, is a deeply riveting page turner. It focuses on the horrific and devastating effects of mental illness if left untreated. The author, Barbara Claypole White, delves deeply into her characters personalities and lives. This book captures you from the beginning until it’s riveting conclusion. Truthfully, it stays with you beyond the last page. Barbara lets you into the mind of someone with obsessive compulsive disorder just enough to give you a realistic look at what their life must be like, and then reigns it back a little so that you don’t shut the book in dismay. Katie Mack abandoned her young daughter when she was just an infant as thoughts of harming her swarmed her mind. She thought the girl would be safer without her, and by the time she got treatment and found herself in a semi-stable state, her husband had moved on and told their daughter that she was dead. Over a decade later fate steps in and mother and daughter meet. Katie randomly comes back into contact with her daughter, only to realize that her own mental illness was now manifesting itself in her daughter. Her attempts to help her and deal with her own continuing issues make up the bulk of the story. This story is a heartbreaking journey through mental illness and the many view points of the people who are effected by it. I adored it. Ten stars wouldn't be enough for this read. 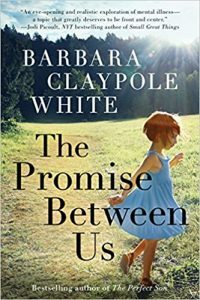 Bestselling author Barbara Claypole White creates hopeful family drama with a healthy dose of mental illness. Originally from England, she writes and gardens in the forests of North Carolina where she lives with her beloved OCD family. 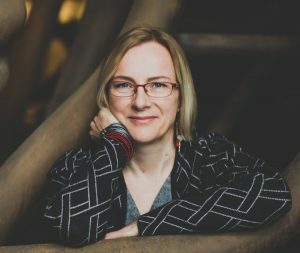 Her novels include The Unfinished Garden, The In-Between Hour, The Perfect Son, and Echoes of Family. The Promise Between Us, a story of redemption, sacrifice, and OCD, has a publication date of January 16th, 2018. She is also an OCD Advocate for the A2A Alliance, a nonprofit group that promotes advocacy over adversity. To connect with Barbara, please visit www.barbaraclaypolewhite.com, or follow her on Facebook. She’s always on Facebook.